I can't believe this question hasn't been asked here before, but I haven't been able to find it, so here goes. When was the first spaceship featured in science fiction? By the time of Asimov, spaceships were already imagined as something like they are in a lot of science fiction today. I remember reading about a more primitive device described by H G Wells Jules Verne (thanks @terdon) in which pods were fired from a huge cannon into space. Maybe he was the first. Maybe there were others even before him - da Vinci came up with the idea of helicopters in the 16th century, so who knows. Maybe the idea even goes right the way back to the ancient Greeks, like the steam engine. I'll be fascinated to find out! For the pedants: a spaceship is a vehicle that can travel outside of the Earth's atmosphere. Actually landing on another planet or moon would be preferred, but just going into orbit is acceptable. Carrying people or animals would also be preferred, but again unmanned craft are acceptable. The answer depends on just how pedantic you want to be. As Terdon has already pointed out, the first vessel used to travel through space in a manner vaguely similar to scientific reality was probably the "projectile" (Jules Verne's own name for it) in From the Earth to the Moon. However, as Verne's nomenclature suggests, this wasn't so much a spaceship in the sense that we think of such things, but an actual projectile, like an oversized artillery round. As I understand it (which should be taken with a grain of salt, since I haven't read the book), this device functioned in more or less the same way any other projectile does - someone shoots it out of a gun or cannon of some kind, and the projectile (and whatever or whoever is inside of it) goes in the direction in which the gun was pointing. In other words, the passengers were not driving the projectile, they were merely along for the ride. Furthermore, it appears that Verne never actually referred to his "projectile" as a "spaceship" or "spacecraft". However, the term "space-ship" was used to describe the projectile in an article written in 1880 about the book in question; this article was published in the "Pall Mall Gazette". Apparently, the first author to use the word "spaceship" himself in a story was actually J.J. Astor1, in a novel called A Journey in Other Worlds, published in 1894; and from what I have found on the subject, this was the first depiction of a space vehicle which was actually piloted by the people inside of it (as opposed to a hollow shell being fired out of a cannon, leaving the occupants to pray that it didn't go off course and send them hurtling through space forever). The credit for 'spaceship' in the sense of “a manned spacecraft” usually goes to J. J. Astor’s 1894 novel A Journey in Other Worlds, a futuristic tale set in the year 2000. 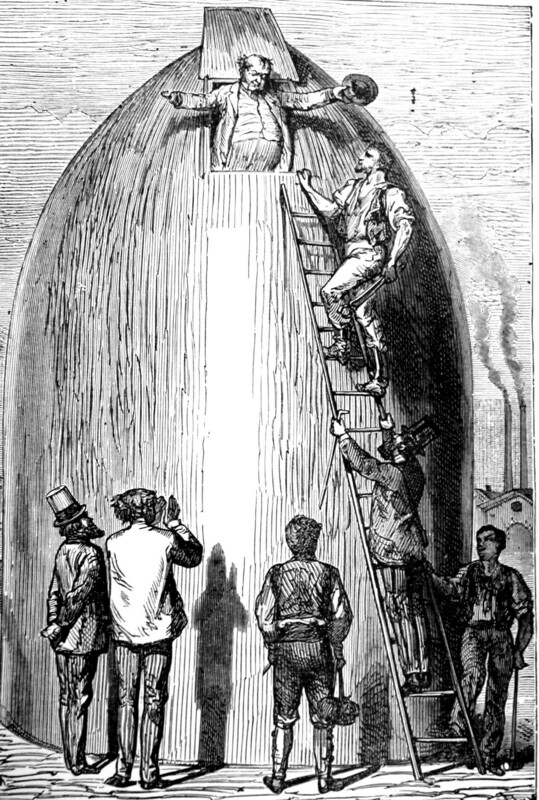 However, space-ship also appears in an 1880 Pall Mall Gazette, in reference to Jules Verne. The first fictional account of rockets being used to travel to space may have been written by the Russian polymath Konstantin Tsiolkovsky, who was actually a scientist, among other things. Most of his work was true scientific research and theory, but he also wrote several science fiction stories, largely aimed at a younger audience. Included among these is a novella written in 1893 titled On the Moon. It could be argued that Tsiolkovsky was the first author to bring a formidable dose of scientific reality to space travel stories; his more serious work is still highly respected in academic circles to this day. And Arthur C. Clarke claimed that The Other World: Comical History of the States and Empires of the Moon by Cyrano de Bergerac, published in 1657 (after de Bergerac's death), invented the concept of ramjet technology being used for space travel. Note: Thanks to rand al'thor for suggesting that I include this in my answer, and to J... for providing the information in his own excellent answer. One of the earliest examples of something similar to science fiction literature is ancient Indian poetry such as the Hindu epic Ramayana, which describes ancient flying machines or “mechanical birds” [Note: as has been pointed out in the comments, these devices may have been more like chariots than birds, although there is evidence for both interpretations] that could travel through air, earth and even fly into outer space. While not being even remotely realistic, the design of these “mechanical birds” illustrates a belief that space travel could be achieved in mechanical means rather than magic or godly intervention. 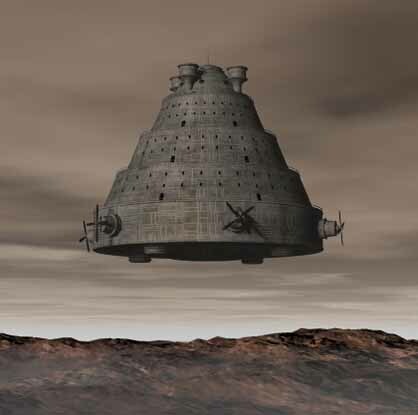 Interestingly, these ancient flying machines, as the reader will see, are much more sophisticated than many of the travel methods created by science fiction authors in the medieval era or even the enlightenment. 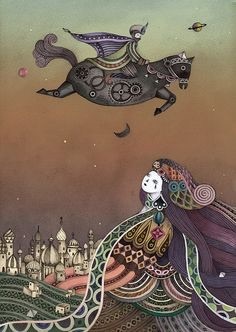 Another early source that has certain elements of science fiction and space travel is The Ebony Horse, one of the stories from the One Thousand and One Nights. In particular, the story features a mechanical horse, which is capable of space travel. Once again, this example is not that imaginative, however, it illustrates the spreading belief in the possibility of space travel using purely mechanical means. The "mechanical horse" from The Ebony Horse in One Thousand and One Nights. In the first half of 17th century, Johannes Kepler wrote Somnium, which is often regarded as the first real work of science fiction. The book describes a journey to the Moon and how the Earth would look as observed from there. The Man in the Moone, published only 4 years later is also among the first real science fiction works. This book, written by Francis Godwin, as you might guess from the title, describes a journey to the Moon. The author, similarly to many other early pioneers of science fiction, was influenced by the astronomical discoveries of the day, including work by such people as Kepler, Copernicus, Gilbert and others. Despite of such fascination with early science, Godwin’s chosen method of travel to the Moon was huge wild swans, which were connected together in a sort of a kite. Not very scientific, but, hey, let’s give this guy some extra points for creativity. The 19th century saw a plethora of early science fiction works, the most famous of which were Frankenstein by Mary Shelley, From Earth to the Moon and Journey to the Center of the Earth by Jules Verne and, of course, The Time Machine by H. G. Wells. For us the most important work of these is the mentioned Verne’s story of an incredible journey from Earth to the Moon using a space gun — a cannon that is used to shoot a projectile into space. This projectile could then carry 3 people, including food water, oxygen and other crucial cargo. Verne even included some basic calculations on the requirements for the cannon, which appeared to be surprisingly accurate. As it can be seen from the picture below, the projectile even resembles a modern space shuttle a bit, illustrating how far science fiction has evolved since the beginning of the genre. Diagram of the interior of Verne's "projectile"
Now we're getting into an area where it is hard to set any limits on what qualifies as a vehicle, and what kind of travel is relevant. 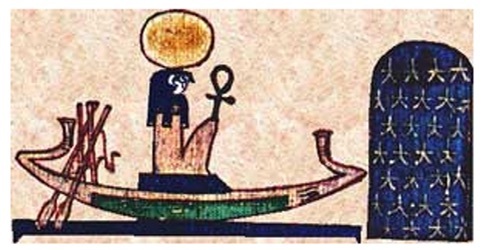 Many - perhaps most - ancient cultures conceived of the motions of the sun and moon as indicating that the respective gods associated with those objects were crossing the sky in enormous, magical boats or chariots of some sort. However, I doubt that many ancient people believed that humans could achieve similar space flight, and the issue of how literally the ancients took these myths is certainly debatable. Still, to some extent, a boat or chariot carrying the sun or moon across the sky might qualify as space travel using a vehicle of some sort. 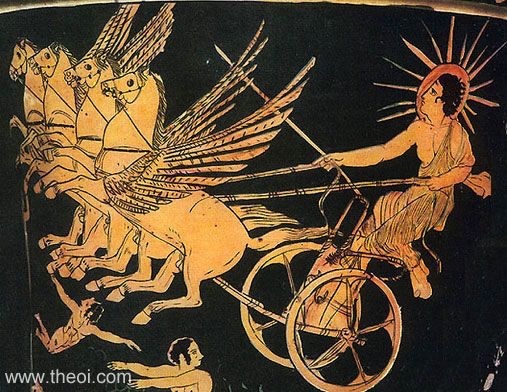 Ancient depictions of gods carrying the sun across the sky: Above - Ra (Egyptian) in a boat; Below - Helios (Greek) on a chariot. 1The J.J. Astor who wrote "A Journey In Other Worlds" was none other than the famous business tycoon John Jacob Astor. One of the wealthiest people in the world at that time, his family is legendary for being robber barons, creating the Waldorf-Astoria Hotel, and many other well known ventures. J.J. Astor himself achieved a final claim to fame by being the wealthiest person to die aboard the Titanic. Lucian of Samosata wrote his True History in the 2nd century AD, featuring an actual ship blown to the Moon by a whirlwind, Dorothy-to-Oz-style. Surely an actual ship counts? It tells the story of the Baltimore Gun Club, a post-American Civil War society of weapons enthusiasts, and their attempts to build an enormous sky-facing Columbiad space gun and launch three people — the Gun Club's president, his Philadelphian armor-making rival, and a French poet — in a projectile with the goal of a moon landing. Arthur C Clarke credited this book with being the first example of a rocket-powered space flight, and for inventing the ramjet. The narrator tries again to construct a way of reaching the Moon, this time through a flying machine that he launches off a cliff's edge. Though the craft crashes, local soldiers attach rockets to it, hoping that it will fly to celebrate the feast day of St. John the Baptist. Dismayed at this use of his machine, the narrator attempts to deconstruct it while the fuse is lit, but the machine takes off and sends him into space. In part two, a new machine that focuses solar energy through mirrors to generate bursts of air sends the narrator to the Sun. Those living on a Sun spot teach him about the solar system by relating it to how atoms move. In ancient vedic literature of India and in Mythological epics like Mahabharata and Ramayana, flying machines were depicted. They were called Vimana. I remember that histories of science fiction include several stories of interplanetary travel at about the same date as Jules Verne's From the Earth to the moon, and some of them may be steerable space ships instead of mere projectiles like Verne's. 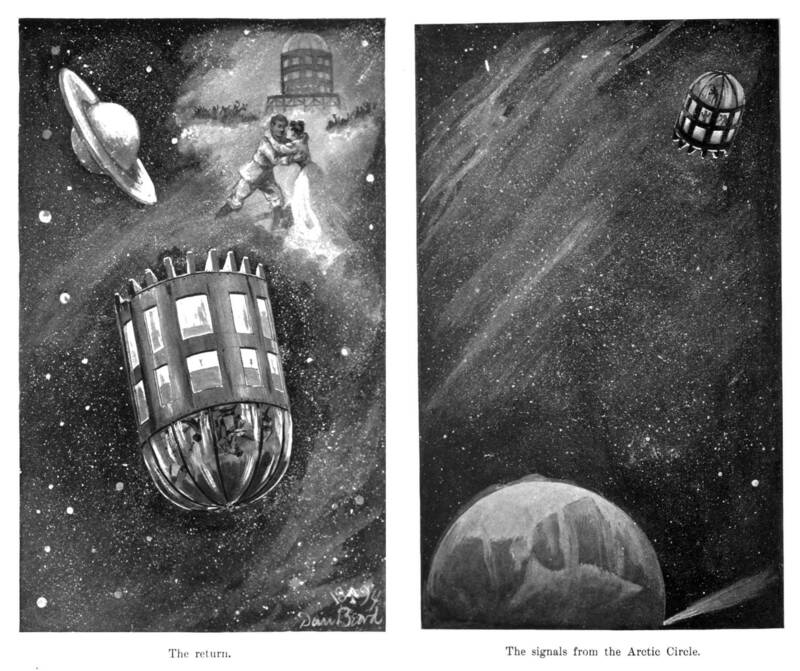 Thus J.J. Astor's 1894 book was probably not the first interplanetary story with a space craft. This J.J. Astor was not THE J.J. Astor but merely A J.J. Astor, one of the descendants - probably a grandson - of the J.J. Astor who founded the family fortune. These examples which I could remember and look up are just a few of the nineteenth century stories of interplanetary travel, usually with some type of more (or often less) plausible space vehicle. I have only read the Poe story. Thus I suspect that it will take a number of different answers before the best possible one is given. A couple of years ago I found a website which listed the first or earliest examples of many hundreds or thousands of science fiction ideas that the compiler could find. That would be a good place to look for the earliest space ship. Depending on the source describing a legendary Chinese visionary, Wan Hu became our world's first astronaut in either 2000 BC or the 16th century. "Tradition asserts that the first to sacrifice himself to the problem of flying was Wang Tu, a Chinese mandarin of about 2,000 years B.C. who, having had constructed a pair of large, parallel and horizontal kites, seated himself in a chair fixed between them while forty-seven attendants each with a candle ignited forty-seven rockets placed beneath the apparatus. But the rocket under the chair exploded, burning the mandarin and so angered the Emperor that he ordered a severe paddling for Wang." 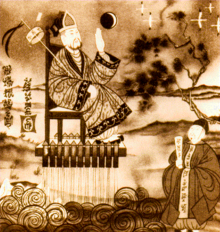 "Early in the sixteenth century, Wan decided to take advantage of China's advanced rocket and fireworks technology to launch himself into outer space. He supposedly had a chair built with forty-seven rockets attached. On the day of lift-off, Wan, splendidly attired, climbed into his rocket chair and forty seven servants lit the fuses and then hastily ran for cover. There was a huge explosion. When the smoke cleared, Wan and the chair were gone, and was said never to have been seen again." If the time period of the first article is to be accepted then the incident predated the written Chinese language. The lack of a first hand written account may be the reason behind the fact that there is some confusion as to whether Wan Hu flew to the moon, blew himself up into so many small pieces that the witnesses believed he flew to the moon² or didn't go anywhere and was summarily beaten by the Emperor for subjecting the mandarin to collateral burns. In modern times, a crater on the far side of the moon was named Wan-Hoo (crater) in the memory of the Chinese legend, the alleged first recording of an astronaut. Source: NASA Catalogue of Lunar Nomenclature. NASA RP-1097 (circa 1982). ¹ The Scientific American article referred to Wan Hu as Wang Tu but there are too many similarities in the narratives to believe these are two separate incidents. ² I don't beieve that survival was a criteria in the original question. If you make the definition loose enough, you can call Icarus's wings or Apollo's chariot a spaceship. I don't think these should be considered SF, since they clearly aren't science-based. Jules Verne (From the Earth to the Moon, 1865) and H.G. Wells (The War of the Worlds, 1897) wrote about vessels that were simply projectiles that followed ballistic trajectories. This was completely inconsistent with the known science of the time, since the sudden accelerations would have destroyed the vessels and killed the passengers inside. If you want to talk about anything with a meaningful basis in science, you need to talk about rocket propulsion. The detailed development of the real science of controlled rocket propulsion as a mode of travel dates to Tsiolkovsky (1903) and Goddard (1912). E. E. "Doc" Smith's Skylark series, beginning in 1928, is one of the earliest SFnal examples of which I know. I haven't read it, but apparently it does a decent job of following Newton's laws, and the spaceship are propelled by matter-energy conversion. It was published in Amazing Stories, which started up in 1926, marking the beginning of the idea of SF as a genre. While other works listed may precede it, I'm surprised no one has mentioned H.G. Wells' "The First Men in the Moon", published in 1901, which featured a ship propelled by cavorite, a material that blocked gravity. Not the answer you're looking for? Browse other questions tagged spaceship history-of or ask your own question. What was the first sci-fi work that had an intelligent virus/bacterium? What is the first Fantasy work to feature a wand?